The Maryland Art Therapy Association represents individuals who are dedicated to the art therapy profession, and who have an interest in promoting its growth throughout the state. Our membership is comprised of 80+ professional art therapists, students, and related mental health professionals. The Maryland Art Therapy Association strives to provide the residents of Maryland with quality information, and access to services. We are an affiliate chapter of the American Art Therapy Association. On March 12-13, MATA was represented at the 2018 Annual Arts Advocacy Day in Washington, DC! Arts advocates from around the country met on Capitol Hill to advocate and educate lawmakers about the importance of funding the arts. Along with AATA, local Art Therapists have joined this national conversation. Special thanks to MATA Secretary Roz Vanderpool for her participation in this event! The newest Art Therapy BA/MA program is happening here, at Notre Dame of Maryland University! 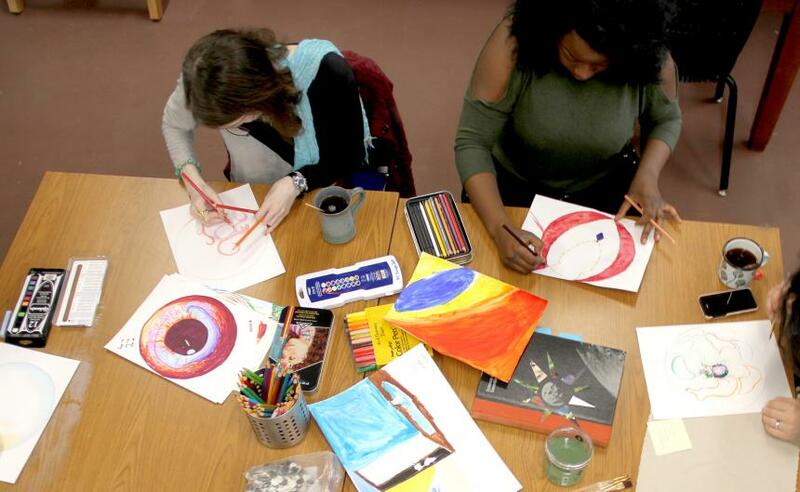 We're excited to see the program at Notre Dame of Maryland University develop, and introduce homegrown professionals into the field of art therapy! Notre Dame is offering both a BA program and an MA program in Art Therapy. Those interested in learning more about the graduate and undergraduate programs at NDMU are encouraged to contact Program Director Cathy Goucher, at cgoucher@ndm.edu. Registration is now open for the 49th Annual Conference of the American Art Therapy Association, in Miami Florida! Click through for more information.